Hell’s Kitchen, the area west of 8th Avenue and between 42nd Street and 59th Street, used to be one of the city’s most notorious slums. It was one of the roughest districts in the city and was one of the many battlegrounds for gang supremacy all the way into the 20th Century. 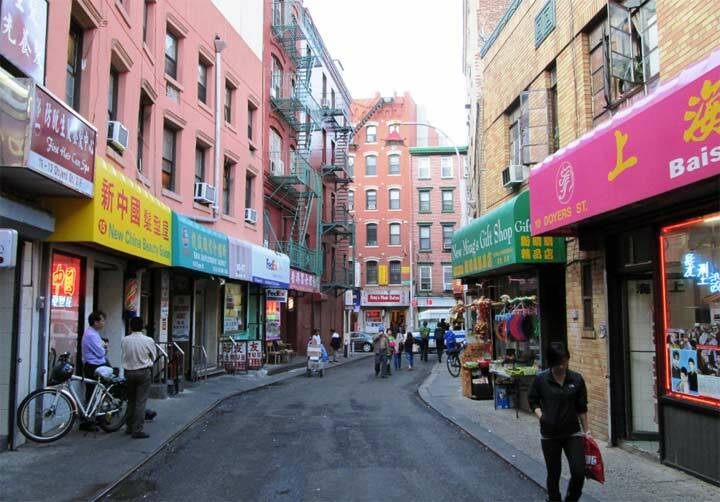 In recent decades, the neighborhood has made great strides of improvement and 9th Avenue, especially, is now known as the ethnic foods capital of the city. Today’s Hell’s Kitchen is one of the city’s oddest mixes, a residential neighborhood on the edge of some of the heaviest traffic in the Northeast, as a major bus terminal and New Jersey Tunnel dump traffic into it. Its position west of the Great White Way has left it with a showbiz community contained within a neighborhood full of picturesque 19th Century churches – some theater companies operate within church buildings. Hells Kitchen also has a longstanding restaurant row on 46th Street and also a new restaurant row anchored by an ancient tavern and a classic diner. The tour, once gain in spectacular weather, took us from Penn Station in a generally northwest direction along 10th and 11th Avenues with plenty of side trips into side streets. Flickr page featuring highlights from Tour #78. Photos by Bob Mulero and Pat Sweeney. For tour information, email info@astorialic.org or twitter @LIChistory. I usually just call that post office the General Post Office rather than its actual name. I worked for UPS from 1975 to 1982 and the Market Diner was the place to go when working the graveyard shift for coffee. It also had a bar where UPS supervisors would drink, after work. The Landmark Tavern was the upscale drinking spot, reserved for division managers and up. In the summer, we would go up to Ninth Ave., grab a few 6 packs from a deli and head to Pier 82, the Circle Line pier, and drink there, until one day, someone came along and punched a manager in the eye for no apparent reason and almost blinded him. After that, senior management to us to stay away from the pier. That’s it? I’m not very technological, but am I missing something? Should I be clicking on something somewhere? I hate to grouse, but … no narrative of where you went, what you saw, what the photos represent? Now that I live on the west coast, I was really looking forward to seeing and reading about my neighborhood. I don’t recall the main post office or Penn Station being part of Hell’s Kitchen (they are located below 34th St). When I was living there, it was known that Hell’s Kitchen was from 38th Street north to 53rd St and from a bit east of Ninth Avenue west to the docks. Why so little about a tremendously interesting, historic neighborhood?? I used to do comprehensive breakdowns of the tours and what we saw, but those pages were taking me days to write, and I’m going to repeat the tour someday, so I’d rather that people get the tour details … get ready… _on the tour._ I’d advise people who want to see what’s on the tour to attend the tour. Meanwhile, there are plenty of photos in flickr with an identification of what they are. We met at Penn Station which indeed south of Hell’s Kitchen, and ended at Columbus Circle, which is north of it. I’m sure you’ll forgive me if I provide details on every interesting location we encounter on the tours. Sorry…I didn’t mean to be so snippy, but I live on the west coast and have never been in the city at the time of any of the tours you’ve given (and there are many I would have liked to have gone on). Although I do recognize the Landmark and the Actor’s Studio, all I get for identification is a “(number)FNY78.” Again, my apologies. I’ve never thought of Hell’s Kitchen as going south all the way to 34th St. My recollection was that it stretched from roughly 59th to 42nd. Above Columbus Circle was the Upper West Side and below Times Square was The Garment District. Am I the only one who thinks so? 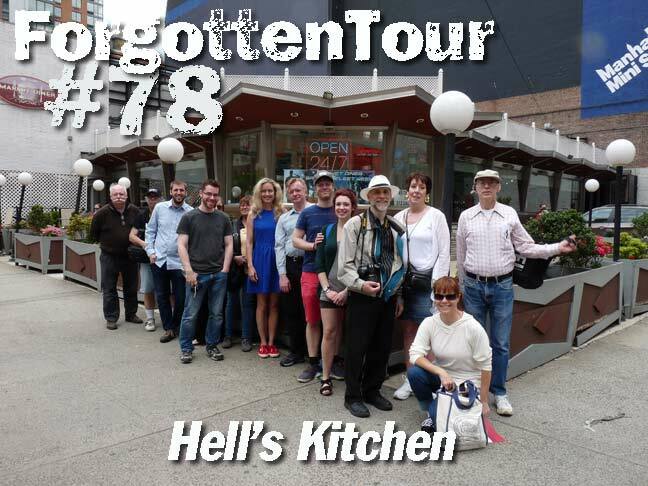 We began the tour at Penn as a convenient meeting place and we knew that Hell’s Kitchen doesn’t begin there.